Some words related to engineering are known as engineering terms. When these engineering words are used in mechanical engineering, which is called as mechanical engineering terms. In engineering technology especially internal combustion engine technology, some common engineering terms are referred. Below mentioned terms are highly useful for your interview in engineering companies. These terms will help all particularly, the engineer who is related to I.C.Engine. The Inside Diameter of the Cylinder is known as the Bore and it is measured in millimetres (mm). It is the distance traveled by the Piston from one of its dead center position to the other dead center position. They correspond to the positions occupied by the piston at the end of its stroke, where the center line of the Connecting Rod and Crank are in the same straight line. 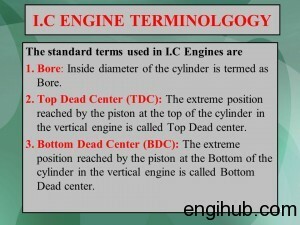 For Vertical Engine, these are known as Top Dead Center (T.D.C) and Bottom Dead Center (B.D.C) position. In Horizontal Engine, these are known as Inner Dead Center (I.D.C) and Outer Dead Center (O.D.C) position. In Vertical Engine, the topmost position of the Piston towards the cover end side of the cylinder is known as Top Dead Center. In Vertical Engine, the lower position of the Piston towards the Crank end side of the cylinder is known as Bottom Dead Center. It is also known as “Swept Volume”. This is the volume through which the Piston sweeps for its one Stroke. It is equal to the Area of the cross-section of the Piston multiplied by its Stroke Length. It is the Volume included between the Piston and the Cylinder Head when the Piston is at its Top Dead Center in Vertical Engine and inner Dead Center in Horizontal Engine. The Clearance Volume is generally expressed as percentages of Swept Volume. It is the distance traveled by the Piston in one minute. The piston Speed=2LN meter/min. If the R.P.M. of Engine Shaft=N and length of Stroke=L meter. This is the distance between the Center of Crankshaft and Center of Crank pin. Hence the distance will be equal to half the Stroke Length.